A new image from NASA's Spitzer and Hubble Space Telescopes looks more like an abstract painting than a cosmic snapshot. 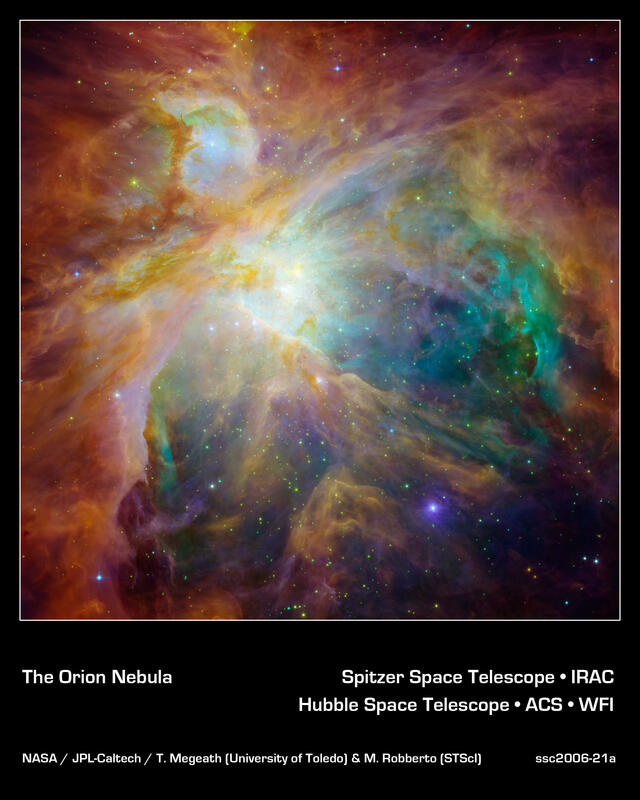 The masterpiece shows the Orion nebula in an explosion of infrared, ultraviolet, and visible-light colors. It was "painted" by hundreds of baby stars on a canvas of gas and dust, with intense ultraviolet light and strong stellar winds as brushes. Wisps of red and orange detected by Spitzer indicate infrared light from illuminated clouds containing carbon-rich molecules called polycyclic aromatic hydrocarbons. On Earth, polycyclic aromatic hydrocarbons are found on burnt toast and in automobile exhaust. Additional stars in Orion are sprinkled throughout the image in a rainbow of colors. Spitzer exposed infant stars deeply embedded in a cocoon of dust and gas (orange-yellow dots). Hubble found less embedded stars (specks of green) and stars in the foreground (blue). Stellar winds from clusters of newborn stars scattered throughout the cloud etched all the well-defined ridges and cavities. 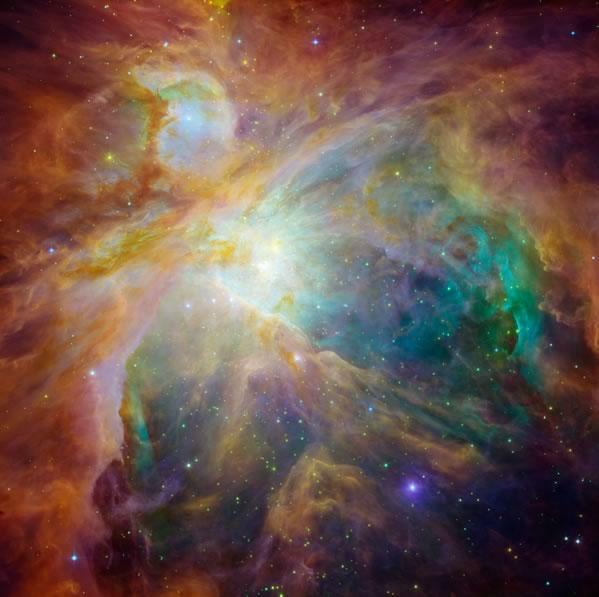 Located nearly 1,500 light-years away from Earth, the Orion nebula is the brightest spot in the sword of the hunter constellation. The cosmic cloud is also our closest massive star-formation factory, and astronomers suspect that it contains about 1,000 young stars. The Orion constellation can be seen in the fall and winter night skies from northern latitudes. The constellation's nebula is invisible to the unaided eye, but can be resolved with binoculars or small telescopes. A mi me parece muy interesante y prÃ¡ctico el controlar los 'dichosos' 404, por lo que me gustarÃ­a saber si se dispondrÃ¡ de la opciÃ³n de personalizar estos errores en los blog de Bl.gaeroGrgcias.